Warburton is a country town in Victoria, Australia, 72 kilometres east of Melbourne's central business district. 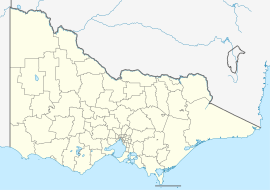 Its local government area is the Shire of Yarra Ranges. At the 2016 census, Warburton had a population of 2,012 people. The Post Office opened around 1884. Two earlier offices named Warburton were renamed as Launching Place and Hoddle's Creek. Warburton was connected to Lilydale by a Victorian Railways branch line, which was closed in 1965. The railway path is now used for the Lilydale to Warburton Rail Trail, a rail trail used by pedestrians, cyclists, and horse-riders. East of Warburton is a large water catchment area called Upper Yarra Dam, which is designed to supply Melbourne with water sourced from the Thomson catchment area. Robert Hoddle first surveyed this area in 1845 after persistent overwhelming floods impounded development for the city of Melbourne. Together with its neighbouring township Millgrove, Warburton has an Australian Rules football team (Warburton Millgrove) competing in the Yarra Valley Mountain District Football League. Warburton was named after the middle name of unpopular goldfields Police Magistrate for Castlemaine, Charles Warburton Carr by District Surveyor Clement Hodgkinson during the 1860s. It received an official title in 1884. Hodgkinson became Australia's Father of Forestry. Carr was confronted with a population explosion upon opening of the Yarra goldfields in 1859 amid economic depression and was honoured for dutiful administration of the law despite public protests against him. Carr was also Secretary to the Government Inquiry into the Eureka Stockade 3 December 1854 at Ballarat. Charles Warburton Carr never lived in Warburton, he lived in Avoca. Hodgkinson's influence is extensively documented. He is Australia's Father of Forestry. Robert Brough-Symth's (1869) reprint 1980 The Goldfields and Mineral Districts of Victoria, Queensberry Hill Press, Carlton, refers to development of the upper Yarra (pp110) “Much was done under Mr Hodgkinson’s direction, and by the Prospecting Board, to open up the country, but its rich soils, perennial streams and delicious climate are not sufficient to attract to the spot those who vainly seek employment in the streets of Melbourne”. Hodgkinson's good friend, Gold Commissioner for Bendigo and Magistrate for the Yarra Valley, Joseph Panton, named Mt Donna Buang above Warburton in 1865. The sketch map of the upper Yarra water and new bridle track to Woods Point, from Lillydale to Traveller's rest on great mountain road, lithographed at Office of Lands and Survey, 11 Sept. 1865, is available online at the State Library of Victoria. In a letter to The Argus 1 July 1911, Panton stated, "having ascertained from the chief and head of the aboriginal tribe of the Yering valley that the mountain was known as 'Donna Buang' I at once entered that name. My map was published by the Crown Lands department on the original scale of two miles to the inch." Panton was Colonel Anderson's nephew; both good friends with Melbourne Botanic Gardens creator Baron Von Mueller and Hodgkinson. The upper Yarra has a fairy-tale quality. The last major town before Warburton, Lillydale, has similar polar histories, an evidence base that shows that Hodgkinson named the town after Lilly de Castella, daughter of Colonel Joseph Anderson who served as one of the first nominated members of the Victorian Legislative Assembly in the 1850s, and another history, proposes it was named by public servant clerk John Hardy who heard convicts singing when building a road (www.emelbourne.net.au/biogs/EM00855b.htm)! Warburton is a place sometimes far from the hard fast paced world of fact and evidence. The town attracted the wealth of Federation tourism at the turn of the 20th century. It was a honeymoon town. Golfers play at the course of the Warburton Golf Club on Dammans Road. ^ a b "2016 Census QuickStats Warburton". Australian Bureau of Statistics. Retrieved 13 April 2019. Wikimedia Commons has media related to Warburton, Victoria. This page was last edited on 13 April 2019, at 06:32 (UTC).